This comes up often enough that it should be posted as a tech article. This is taken from a different posting where Heater Control Panel Illumination was the topic. 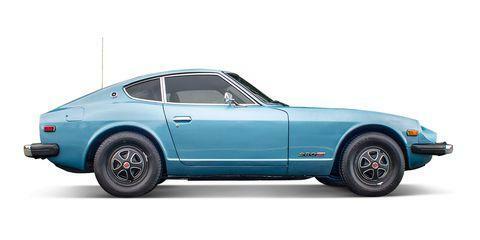 The Clock not working in the Z's is such an endemic characteristic that it almost seems a basic requirement of the car. If your clock works....it's not a Z. As far as your clock, you can fix it, and if you're careful it will last a long while. I fixed a pair of these a couple of years ago and they're still working great. I even went the extra step to calibrate it and now it only gains 1-2 minutes a day. Not a chronometer but definitely much better than not working. 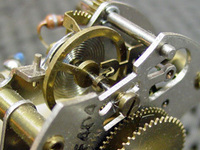 Open the clock housing by removing the two screws holding the face bezel in place. Next gently lift off the clock hands, and carefully remove the face. Below it you should find a black washer and a spring tripod washer. Make sure you don't lose these. Once these are off you can address the main problem with the clock. From the back of the case, ( * see add )remove the 3 nuts that hold the clock mechanism inside the case. Once this is done, carefully force the wire and the rubber boot that powers it, INTO the case, and then do the same thing for the connector. If your connector boot (not the one at the case, but the one where the clock connects to the harness) is pliable enough, gently straighten it out and fold in the heat crimped plastic wings so that it will fit through the hole in the case. Added on edit: The bracket that holds the clock to the dash and fits the outside of the case needs to be removed first. There is also a "newer" clock version where the 3 nuts holding the clock mechanism aren't on the back of the case and the bracket that attaches to the case and dash doesn't have the extended "handle". Be careful opening these as EVERYTHING inside pops out the minute you remove the bezel. At this point you should be able to remove the clock mechanism from the metal case. Take a minute to clean out any dust or gunk inside the case, and if you want it to be brighter when illuminated, paint the inside with a WHITE paint, the green lens on the bulb housing will still illuminate the inside as green, but it will be MUCH brighter when you have the lights on. Be careful not to smear the bulb housing. Set this aside to dry. Now, looking at the clock mechanism. You'll note a little motor on the back side of the mechanism. ( * see add ) Get a bottle of sewing machine oil and a long enough needle and apply a small drop (by small, I mean minuscule) to the motor housing and the associated pivot points. You can power it up right away, although personally I let this soak for a bit. Usually the length of time to let the paint dry in the case is sufficient, or overnight. Added on edit: The newer clocks mentioned before have the motor OPEN and with the shaft of the motor being the PENDULUM of the clock. The earlier clocks had a standard clock pendulum but used the motor to WIND the clock spring. The oiling procedures for both are nominally the same. Next, to ensure that it's working, you can either re-assemble and plug in, or you can provide power to the clock via a 12v power supply. It doesn't require a large current as the motor just winds the spring enough to keep the clock going. If everything is working correctly, you should hear and see the motor wind and you'll notice the pendulum gear begin to oscillate back and forth. I then re-assemble the clock and to ensure it doesn't conk out, I leave it plugged into the power supply for a while. If you want at this point you could calibrate the clock, except for one thing. Most power supplies supply 12.0v DC, while in the car you will be working with 12.8v to 13.5v depending on the condition of your battery and connections. To get it "perfect" you would need to match the voltage in your car. This takes a l o n g time, so leaving it in the car would be a problem, unless you don't mind having it dangling off on the side for days-weeks. So, if you don't mind it running a bit fast (as mine does), just hook it up to your power supply continuously for a few days. Once the clock is functioning properly, set the time to match a KNOWN good clock. Whether it's your wrist watch, a house clock, digital or analog it doesn't matter. You're just going to be using it to compare what the car clock is doing in relation to that one. After 24 hours or thereabouts as it doesn't matter whether you check every 2 hours or 200 hours, compare the time on both pieces. If the car clock shows 12:30 and your reference is 12:00, the car clock is fast, the opposite would be a slow mechanism. On the back of the clock housing, you'll notice a hole, usually with a milky white plug inserted into it, with markings around it ( + | | | - ). Added on edit: The newer clock has ( S <----> F ) with the arrow ABOVE the hole while some older models had ( F <----> S ) with the arrow BELOW the hole. The directions are the same, but it's easy to think they're reversed. Remove the plug, and inserting a small straight screwdriver into this hole, you'll find a screw in there. Give it a gentle twist in the direction you need to adjust the clock. If fast, tweak the screw by a DEGREE or two (360Â° in a complete revolution) in the - direction. If slow, in the +. Be careful not to over-adjust, a small adjustment of a degree can be as much / little as 10 minutes per 12 hours or less, so by doing small adjustments you won't swing erratically all over the place. Reset the car clock to coincide with the reference clock. Recheck the two clocks again in another day or so, and repeat the adjustment until they coincide with each other, or you are satisfied with the amount of disparity.